It was a beautiful day yesterday in Chilbolton, perfect for a visit by more than 40 amateur and professional photographers taking part in the STFC run Photowalk 2012. A photographer gets an unusual angle on the LOFAR-UK LBA field. Image credit: Alan Doo, STFC. 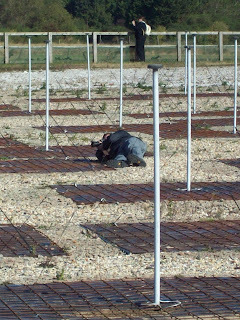 STFC hold photowalks across all of their facilities with an aim of engaging with another stakeholder group, and perhaps collating an image bank of photos, which may be taken in a different style. Yesterday 27 photographers visited Chilbolton in the morning, and 30 in the afternoon. 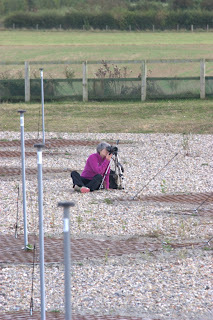 They were given the opportunity to photograph the whole site, including the wildlife! Photographers who took part in yesterday's events will be able to enter their images to a regional, national and international competition for public and expert judging (along with photographers from similar events held at other STFC facilities). Judges will include award-winning photographer Max Alexander who told STFC: "The inaugural Photo Walk competition in 2011 was a fantastic success, producing spectacular photographs of cutting edge science, and I am delighted to be a judge again this year. 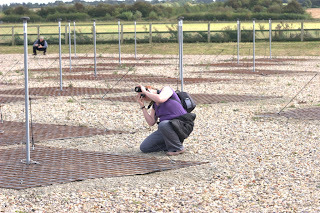 The Photo Walks are a unique opportunity for members of the public and enthusiastic photographers to capture dynamic images at some of the UK's leading science and technology facilities. I thoroughly recommend entering this competition to get behind the scenes of these inspiring and world class facilities." Check out the winners of last year's photography competition. Not that we're biased, but we'll be keeping our fingers crossed that one of this year's winners took a picture of our lovely LOFAR-UK antennas. Following a selection of the 10 best images from each of the four STFC sites, a website will be available for members of the public to vote on the best of the 40. We'll keep you posted on when that becomes available.